It seemed like we were in for a quiet October. The Fed made its expected rate increase and didn’t have any other surprises in its FOMC statement from September. There isn’t another FOMC meeting until November. Mid-term elections will certainly be big news but also aren’t until November. All the ingredients were there for an uneventful October. Except October has been anything but dull. The S&P 500 is down 2.5% month-to-date as I write this so if you just looked at that one gauge of market movement, you’d probably assume we were having an orderly selloff. But take a wider view of the market and you’d see the Nasdaq 100 is down 5% and so is the Russell 2000. Just a week and a half into October, those are big numbers. Keep in mind, 10% down is considered a correction. What’s more, the VIX – the most common gauge of investor fear – is up 24% already this month. At a price of around 18, the VIX is certainly above levels we’d consider normal. (For reference, the price has been hovering around 12 for last few months.) While VIX at 18 isn’t a run-for-the-hills type level for market volatility, it very well may be signaling an underlying current of concern in stocks. The VIX itself isn’t tradable, but several volatility ETPs (exchange traded products) are popular vehicles for trading volatility. Chief among them is iPath S&P 500 VIX Short-Term Futures ETN (NYSE: VXX). VXX tracks the first two futures months in VIX. 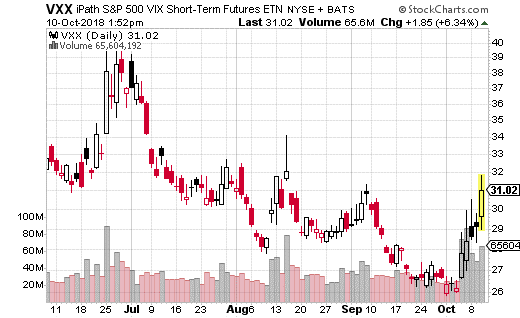 When stocks sell off, it is typical to see VXX move higher as short-term volatility increases. For that reason, VXX is a popular method of hedging portfolio risk (against a big move to the downside). It can also be used to speculate on higher volatility. The convenience of trading volatility through an ETP is a major reason why VXX trades over 30 million shares per day on average, along with around 250,000 options contracts. VXX’s popularity isn’t just on the retail side. Institutional money will also take advantage of the deep, liquid markets provided by the ETP. It’s not unusual to see very large block trades hit the wire in VXX on a daily basis. Some of these large trades may give us an idea of what professionals are thinking about future volatility. In fact, I just came across a rather large VXX call spread which suggests higher volatility may be a feature for the remainder of 2018. With VXX at $28.56, a large trader purchased the December 21st 35-45 call spread for $1.13. That means the 35 call was bought and the 45 call was sold simultaneously for a total of $113 per spread. The trade was done in a block of 31,210 contracts or about $3.5 million worth of premium was spent. The call spread breaks even if VXX is at $36.13 by December expiration. It maxes out at $45 or above where the trader would pull in $8.87 per spread or $28.5 million in profits. For those of you counting at home, that’s a 785% return. Max loss on the trade is the premium paid, or $3.5 million – still a decent-sized risk when you’re talking about losing millions. I also think this trade makes for a good hedge through the rest of 2018. You can even cheapen your hedge by doing a narrower spread. With VXX at $31, you can buy the December 36-41 call spread for just around $0.85. That gives you max profit potential of $4.15 or 488% upside while affordably protecting yourself through the holiday season against a big drop in stock prices.